The MacGregor Family: Sending a Smile Your Way! Sending a Smile Your Way! Not the greatest quality picture as it was taken with a cell phone, but the cuteness makes up for what it lacks in resolution. this is soooo cute! It makes everything easier once they can smile at you! So cute! I think this is the pic that you kept trying to send me and it wouldn't come through on my phone! 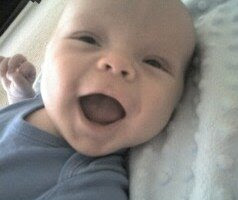 :( I wish it would because then I could show everyone my super cute nephew!